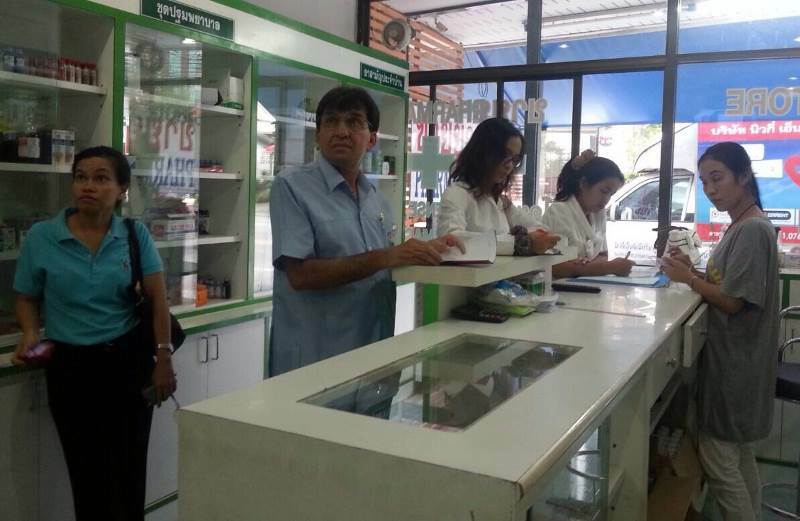 PHUKET: Health officials today (October 10) visited a pharmacy in Pharbaramee Rd, Patong, after reports that 10 teenagers had visited the shop yesterday evening and bought 50 bottles of cough mixture each. Public Health officials check paperwork in the shop. Kathu District Chief Weera Kerdsirimongkol was alerted by local residents after they saw the teenagers coming out of the pharmacy, each loaded down with bottles. Provincial Public Health Department officials visited the pharmacy and found paperwork confirming that 500 bottles of the syrup were sold yesterday. They must now establish whether the cough syrup was being stocked illegally before considering whether charges can be brought against the shop owners. Cough syrup is one of the four ingredients in a mildly narcotic cocktail known as see koon loy (4x100), the other three usually being illegal kratom leaves, cola and ice, though the recipe may vary.